New Year’s is a time when many people plan to make positive changes in their lives—and for some, that may mean pursuing their dreams of starting a new business. For the past four years, OPL has partnered with the Small Business Administration (SBA) to support those looking to develop their businesses or business ideas with a series of “New Year, New Businessopens a new window” workshops in January and February. The series features weekly workshops at different OPL locations, covering a variety of business subjects. Sessions are taught by local experts brought in through SBA partners SCORE and the Nebraska Business Development Center. Going into the fifth year of the series, OPL’s Business Librarian Nick Engert is looking forward to leaning into the subjects that people have found most valuable in the past and introducing new courses and resources to the series. 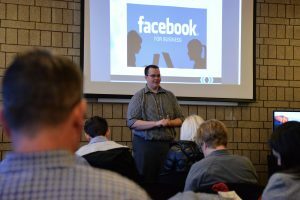 Changes in 2019 include a session specifically on Facebook for Businessopens a new window and another about other social media platforms; as well as the incorporation of one of OPL’s newest databases, Gale Small Business Builderopens a new window, into the Create a Business Planopens a new window session, which will make the workshop more interactive for participants. Engert and Yearwood both said that their favorite part of the series is interacting with the attendees, whether they come for one workshop or the whole series.